Hay Springs, Nebraska August 26, 2012 The rural county road leading to the Mracek’s home in the heart of Western Nebraska’a cattle country. 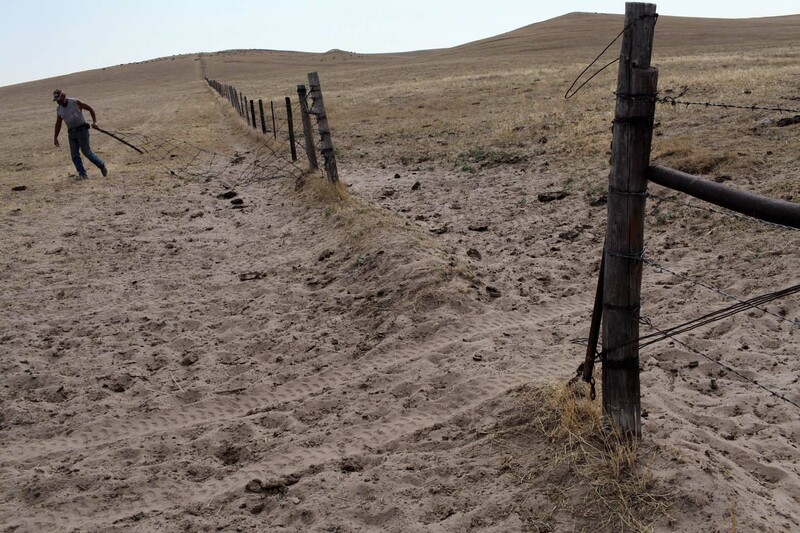 Hay Springs, Nebraska August 27, 2012 Jim Mracek, a caretaker of a 5,000 acre cattle ranch stricken by the drought, closes a fence on his way to round up the cows and their calves. 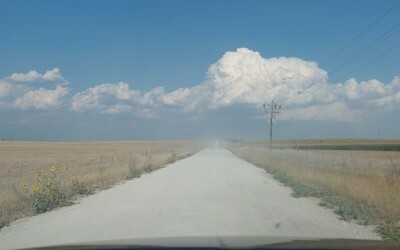 Hay Springs, Nebraska August 31. 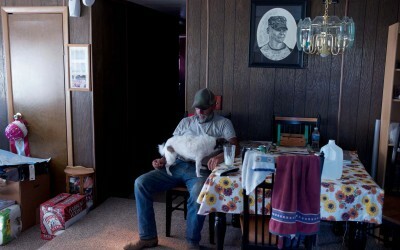 2012 Jim Mracek sits in the living room of his trailer during another rainless day of 102 degree tempertures. 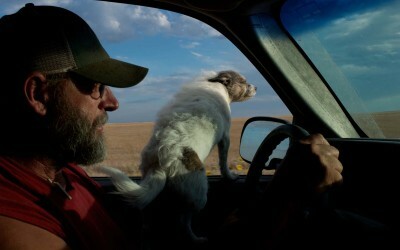 Jim is a caretaker on a 5,000 acre cattle ranch in Western Nebraska. 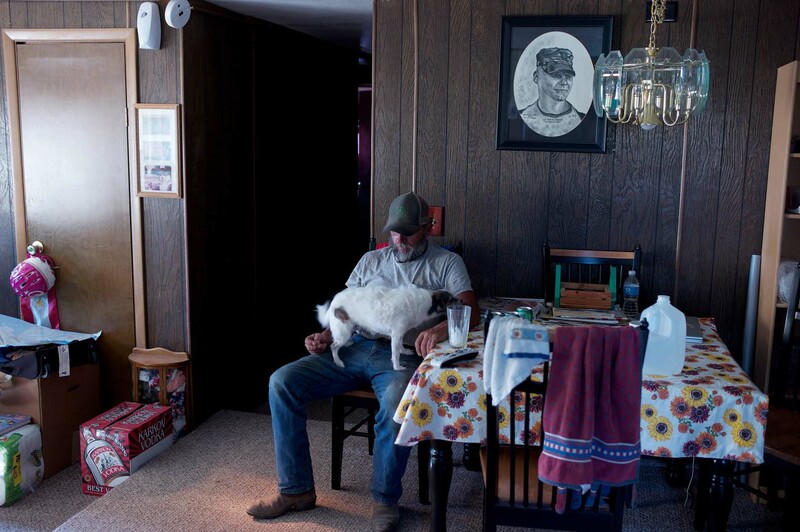 A drawing of his son, Cory, who was killed in Iraq, hangs on the wall. 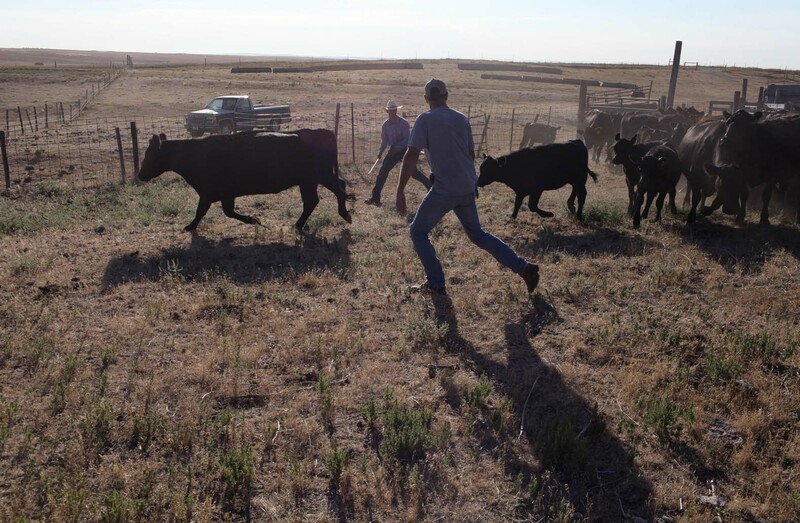 Hay Springs, Nebraska.August 29, 2012..Cattle are rounded up from the grazing fields in order to give them vacine shots. 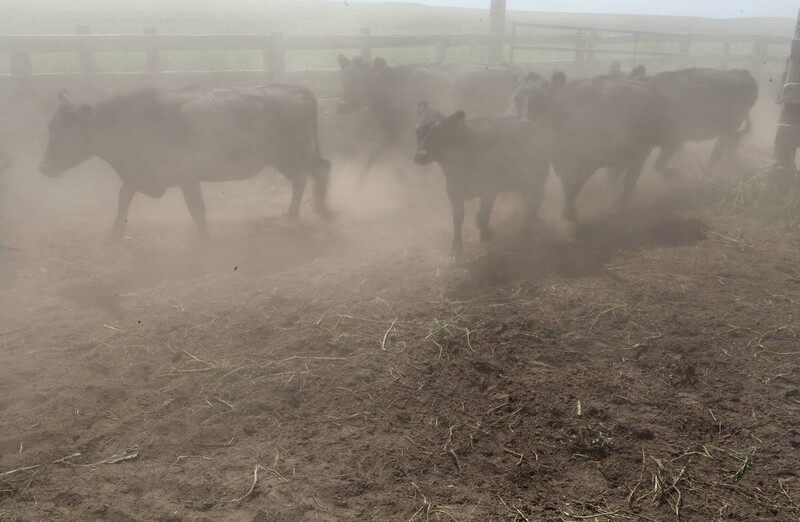 The lack of rain has made the land so dry that huge amounts of dust are kicked up when managing the cows, which often makes the young calves sick from airborne viruses. Hay Springs, Nebraska.August 29, 2012..Cattle ranchers work to seperate cows from their calves in order to give the young animals immunity shots against common diseases. 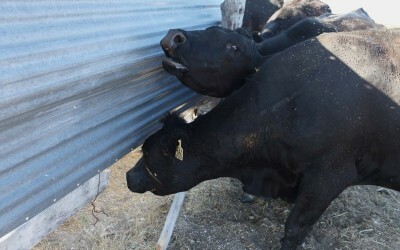 Hay Springs, Nebraska.August 29, 2012..Distressed cows moan for their calves who have been seperated from them on the other side of the wall for vaccine shots on a cattle ranch. 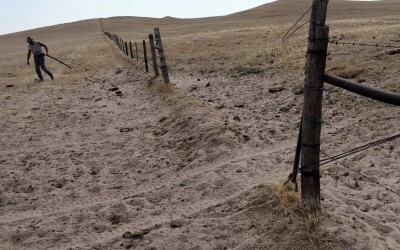 Hay Springs, Nebraska.September 2, 2012..With no rain and daily tempertures over 100 degrees, a cattle ranch’s creek has dried up. 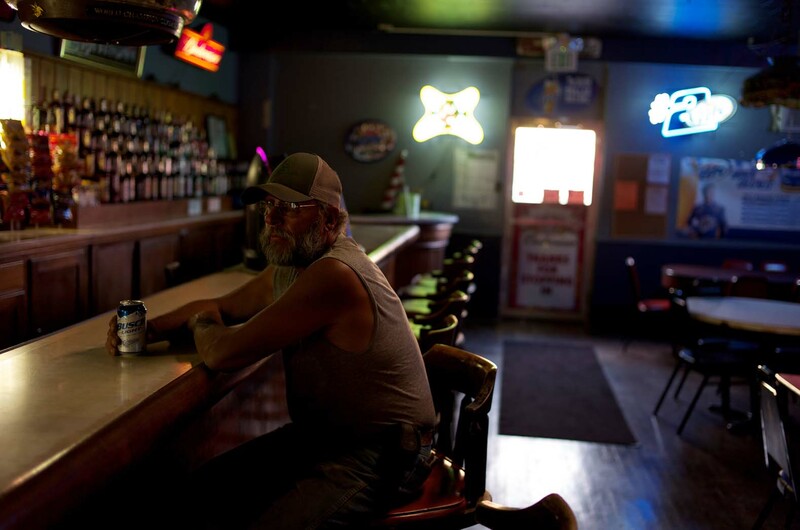 Hay Springs, Nebraska.August 27, 2012..Jim Mracek, a caretaker for a local cattle ranch, has a beer at the end of the day at the one bar in town. 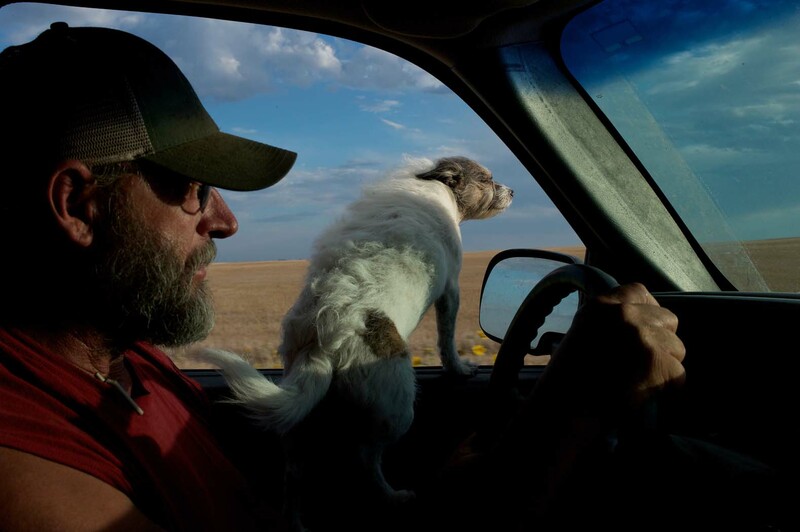 Hay Springs, Nebraska.August 29, 2012..Jim Mracek and his dog drive through Sheridan County in search of the priarie fires that have started from lighting because of the extremely dry condition of the land during the drought. 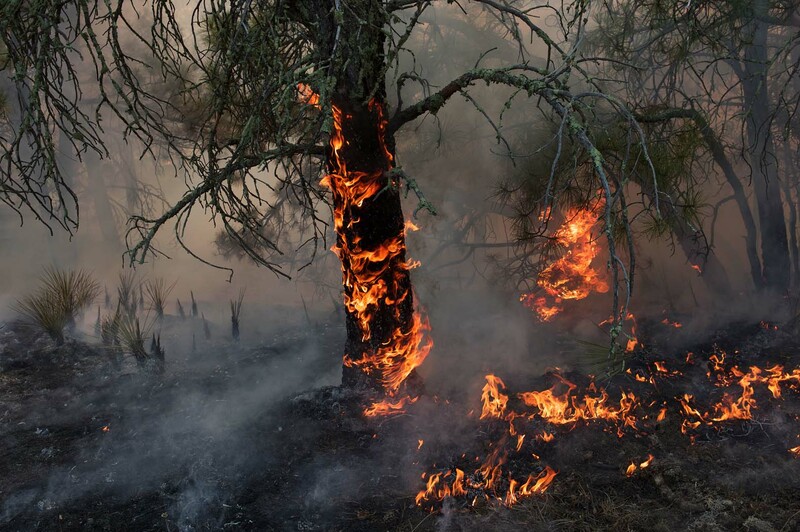 Often, due to the remote location and limited firefighting resources, ranchers and their neighbors have to try and put the fires out themselves. Chadron, Nebraska August 29, 2012 Smoke from the large West Ash Creek wildfire, just Southwest of Chadron, Nebraska, clouds up the horizon, creating its own weather conditions. Hay Springs, Nebraska August 28, 2012 Smoke from prairie fires drifts past an abandoned farm house. 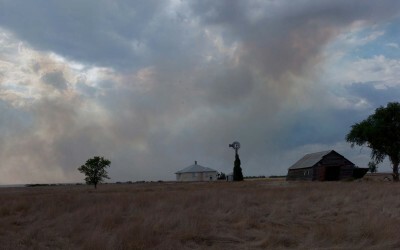 The dry conditions brought on by the drought have threatened many farms with wildfires started by lighting. Hay Springs, Nebraska August 30, 2012 The Wilentz Fire burns a pine tree on cattle grazing land north of Hay Springs, Nebraska. 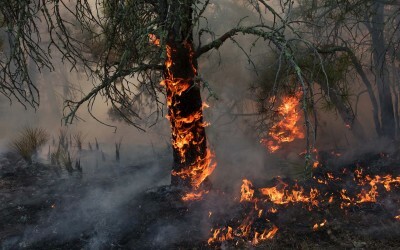 Wildfires are started by lighting, which quickly ignites the very dry land. Hay Springs, Nebraska August 28, 2012 Jim Mracek, a caretaker of a cattle ranch, works the animals and the land in dry and hot conditions during the drought. 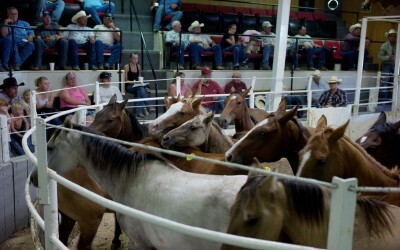 Rushville, Nebraska August 29, 2012 Horses are auctioned for sale en masse at the weekly livestock auction. 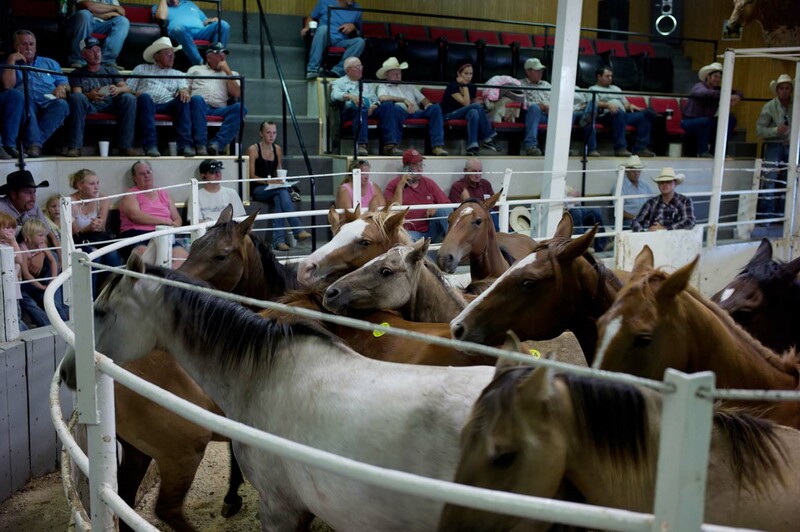 Except for people buying by the weight to ship the horses to Canadian slaughterhouses for the meat, there are almost no buyers. 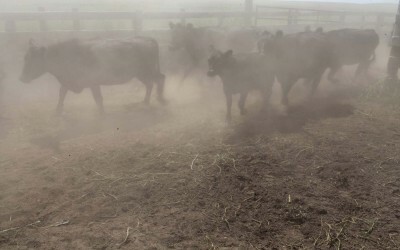 With feed becoming scarce and expensive due to the drought, horses have become a luxury item that few ranchers can afford. Rushville, Nebraska August 29, 2012 Buyers and sellers at the weekly livestock auction take a break for lunch at the auction diner. 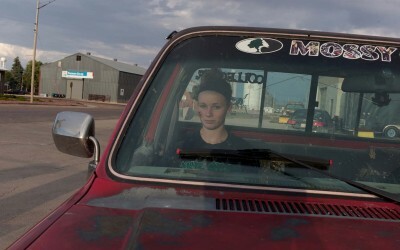 Hay Springs, Nebraska August 28, 2012 A teenager sits in a pickup truck at the gas station in the center of Hay Springs. Sheridan County, Nebraska August 28, 2012 Smoke from a nameless prairie fire drifts across the drought stricken ranchland of Western Nebraska. Hay Springs, Nebraska August 27, 2012 A young couple relax at a going away party for a friend who is leaving the small town of Hay Springs for acting school in San Francisco. 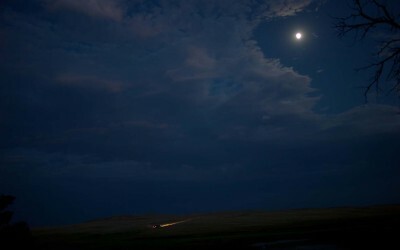 Hay Springs, Nebraska August 27, 2012 As night falls, Jim Mracek drives out to a distant pivot to make sure a field is receiving irrigation water on the 5,000 acre cattle ranch that he looks after. 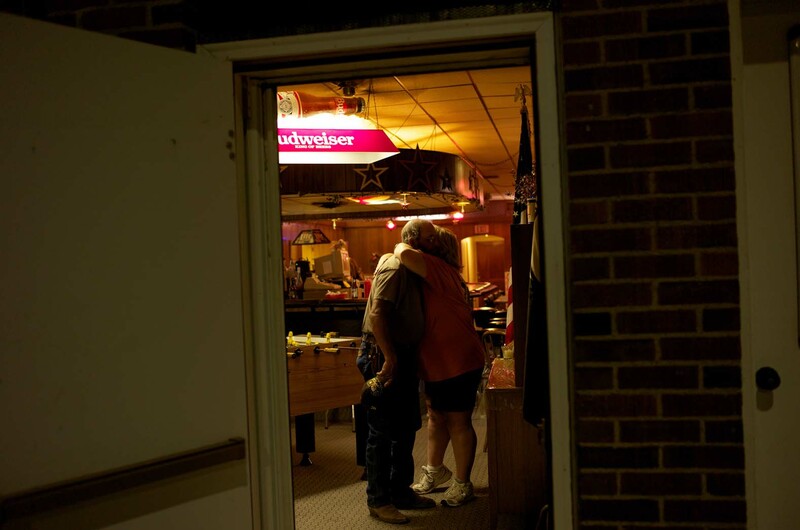 Hemingford, Nebraska August 31, 2012 At a local American Legion hall, Jim Mracek receives a goodnight hug. In the rural community, it is well known that Jim lost his son, Cory, in 2004 to the war in Iraq. 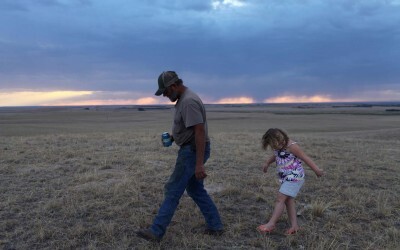 Hay Springs, Nebraska.September 2, 2012..On an evening stroll, Jim Mracek leads his grandaughter across the drought stricken fields of the cattle ranch that he looks after, keeping an eye out for burrs because she is wearing sandals. I first traveled to the small community of Hay Springs, Nebraska in the winter of 2004, for the funeral of Sergeant Cory Mracek, a paratrooper killed in Iraq. 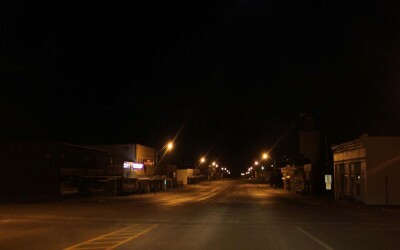 It was not a town easy to forget. Despite the bitter cold, every car on rural route 20, which cuts across Sheridan County, pulled over onto the side of the road to salute the passing funeral procession. In the very small towns of Hay Springs, Rushville, and Gordon, residents bundled up in coats lined the street with American flags. I am a person who remembers things visually; so this summer, when I was searching for an American story, I immediately thought of those pick up trucks on the side of the road. I’d not made a picture then, but I knew it was a place to return to, a place that, in my mind, spoke of an older, more traditional America. 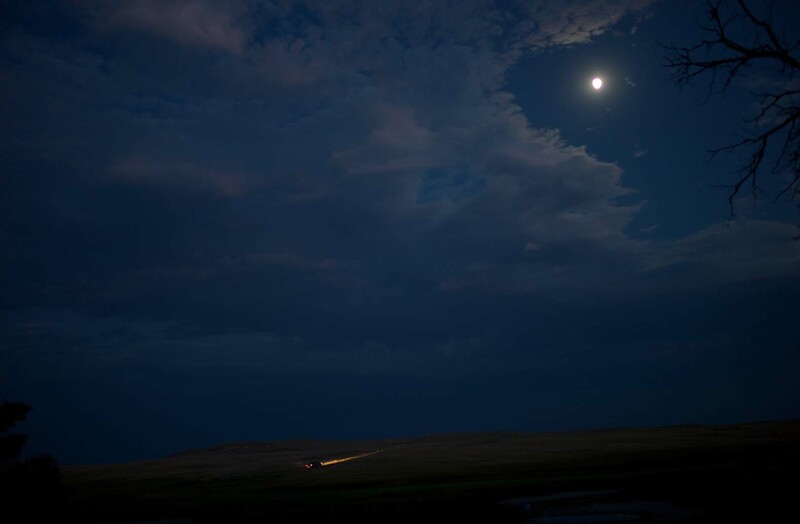 In the heat of August, I decided to photograph the drought that has paralyzed the farms and crops across a giant stretch of the American heartland. 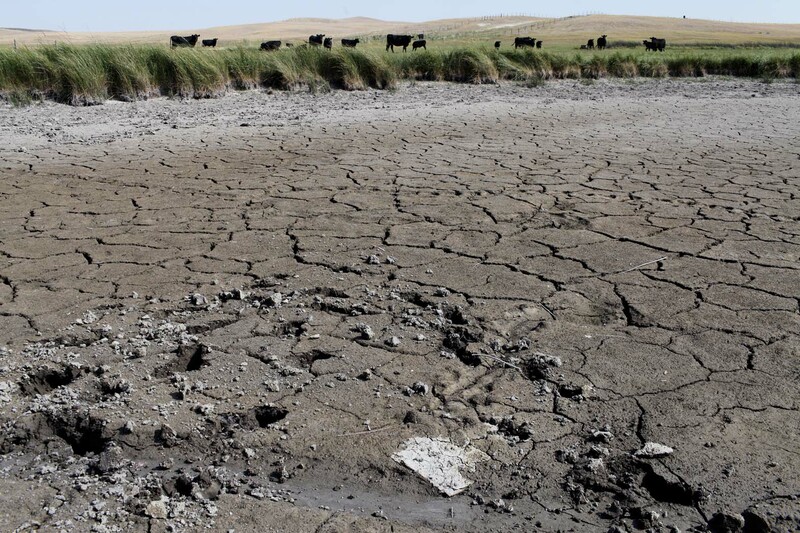 While the drought is very real, and its effects have been devastating for many who earn their living growing and harvesting the food that we all eat, I knew before I even left that it was a weather story. Like any news event, I’d use it as an excuse to search for something more meaningful to me, something harder to explain in a story proposal. I wanted to explore my own country, it’s conservative bedrock, and gain a better understanding of some of the deep divisions that separate that world from Brooklyn. 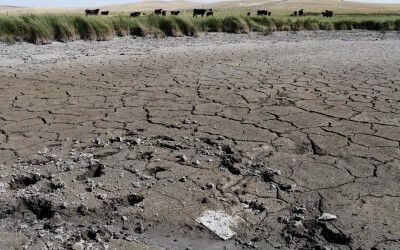 If the drought was what got me there, I hoped to stay for the chance to visit a culture very different from my own. Sheridan County is in the remote northwest corner of Nebraska. Named after the Indian fighter General Phillip Sheridan, who systematically slaughtered the buffalo that roamed these high plains in order to starve his Sioux and Cheyenne enemies, many attitudes feel as if they have been fixed in time. 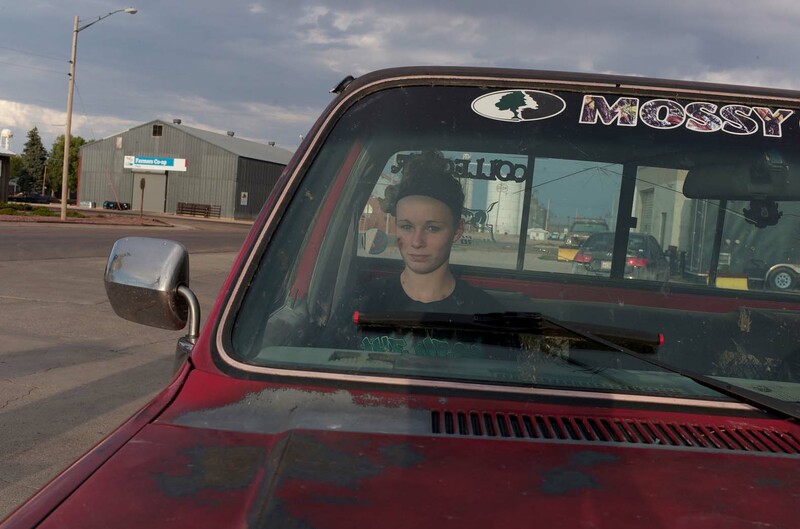 Though just a dozen miles south of the Pine Ridge Indian Reservation, Sheridan County is ninety-nine percent white, and local prejudice against the Indians on the reservation runs deep. The cattle that quickly replaced the buffalo are watched over by the descendents of the immigrant settlers who labored to tame the land, killing the wolf, bear, and lion. These men and women lived outside of the city’s gates. They fought and died to claim this land as their own, in spite of whatever obstacles far-away easterners from New York or Washington placed in their way. 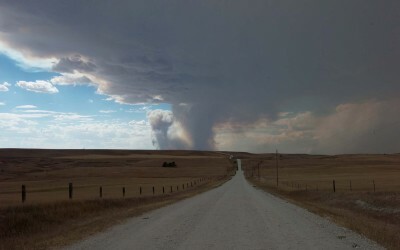 During my stay in Hay Springs, my host was Jim Mracek and his wife Pat, the parents of Cory, whose death had brought me to Sheridan County eight years earlier. Generous to a fault, always willing to help a neighbor, or stranger, in need, the Mracek’s, like their neighbors, are at the same time wary of the larger world that seems to have moved on. 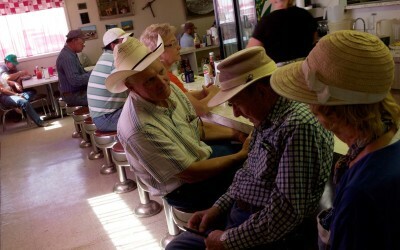 Jim is a caretaker for a 5,000 acre cattle ranch. Like many people who live off of the land, Jim seems to have paid close attention to his surroundings. Dependent upon God’s creatures, it is easy enough to conclude that the world is a harsh, unforgiving place. At the same time, there is a natural order, an accepted balance, a rhythm to life that does not have to be questioned or struggled over. On the ranch, there is no such thing as “can’t”. 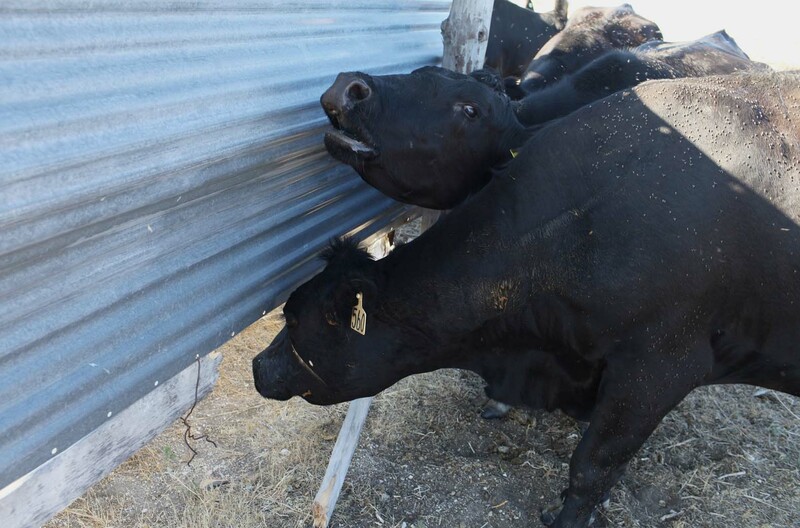 Hard work and patience and then more hard work solve almost any problem, of which there are many- another fence to mend, a stray calf to find, a pivot to check. I failed at fully understanding the political beliefs of a deeply conservative part of the country. The gap between basic political assumptions in rural western Nebraska and my own was just too large to build a bridge over. 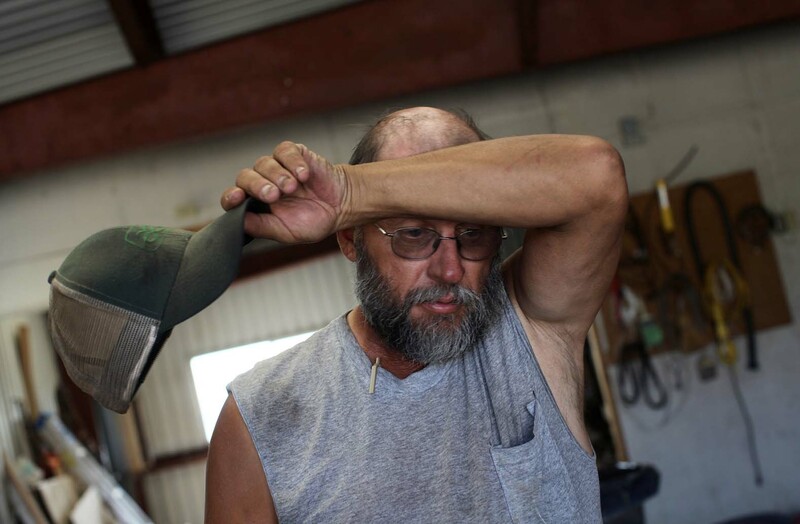 But self-reliance, hard work, an older, more intimate, connected America; these were all things where I could find great beauty, visual, and otherwise. Looking above, into the vast, blue Nebraska sky of the open prairie, I could see the jet streams of the airplanes flying from coast to coast. This is what I wanted to try and photograph, I realized. 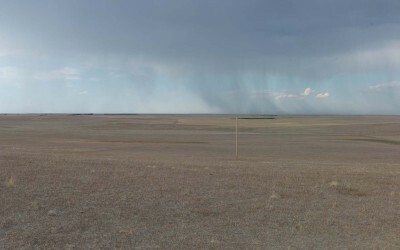 A place, an American Place, that the rest of the nation only sees from the plane window, those grids of intersecting dirt roads mapped across the seemingly endless expanse of land, viewed from 40,000 feet above.